This article was originally published for Booking.com’s Technology blog on November 23rd, 2016. Click here for the original article. Continuous learning on the job is hard. We all see things we want to improve, but maybe we’re missing a few skills to really make an impact. With most days filled with emails and meetings, there’s often not much time left for learning, no matter how much we want to develop our skills. Although many organizations try to remedy this issue by employing external companies to handle training, they rarely follow-up to ensure such trainings are actually value for money. Not only that, employees are often left to figure out how their new skills can be applied to daily work, and sometimes they are even left wondering if the training taught them anything useful at all. I work at Booking.com as an engineering manager, and in my job I wanted to learn about a topic for which there was no formal training. I ended up creating a study group that became the blueprint for autonomous peer learning in our Technology department. It’s an initiative that has been scaled to 50 Peer-to-Peer (or P2P) learning groups over the last 18 months. The premise of P2P groups is that participants take the time to think about what they want to learn and why. This means their learning is tailored from the very beginning, ensuring that it is both relevant to their work and beneficial to their organization. What does it feel like to participate in a P2P group? P2P groups are autonomous peer-learning study groups. Up to six participants meet every week to exchange ideas and learn about their chosen topic. There is no trainer, and participants steer the group in terms of both form and content. 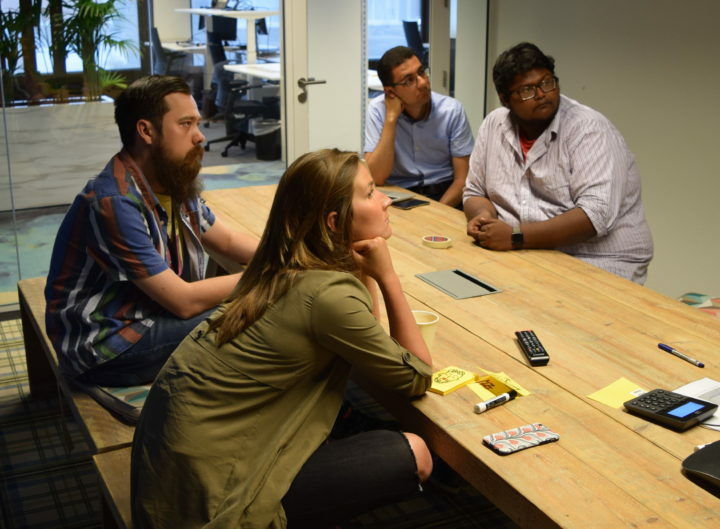 I started and facilitated the very first P2P group at Booking.com, which looked at Distributed Systems. 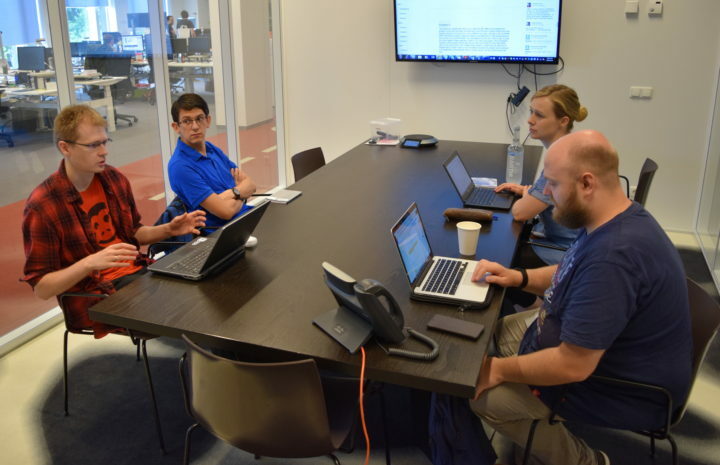 Each week, participants would agree to discuss a topic within that main field, and prepare by researching a publication, video presentation, or open source system tied into that week’s topic. Participants would present what they had learned and answer questions from others, with a vote at the end of each session to decide the topic for the following week. Of course, there is only so much you can do in six weeks. The P2P format tends to be good for a broader overview, but less useful for in-depth learning. Nevertheless, I have seen very good outcomes from our P2P groups. One of the participants in my very first group joined as he was already researching even better ways to store our accommodation availability data. He went on to help implement a totally new system that is now used in production, and ended up using his experience with the group to delve deeper into distributed storage challenges. In another P2P group on the topic of Short-Format Writing, participants would write drafts for articles and give each other feedback on their writing each week. As a participant of that group, I worked on multiple drafts about autonomous learning at Booking.com, which eventually turned into the very article that you’re reading right now! Make it relevant to your organization. By shaping your learning goals into something beneficial to the success of your organization, you will contextualize what you learn and create new connections with current knowledge and skills. Ask yourself what result you want to achieve, and how your newly developed skills will help you accomplish that. There is no trainer. Instead, everybody teaches and everybody learns. If there is a teacher in the room, the group will revert to classroom learning. If you think you need a teacher that’s fine, but then you’re doing regular training, not P2P learning. One facilitator who is not an expert. The facilitator knows as much as any other participant about the topic, and is principally there to help with logistics, group communication, and gathering learning materials. Keep the group small. Four to six participants maximum, including the facilitator. This guarantees that everybody has an opportunity to share. Be ready to commit time. The group meets for two hours per week for six weeks, during working hours. Participants must be ready to spend one to three hours per week studying at home. Having a finite duration of six weeks makes participants feel more comfortable about investing their time. Do a kick-off meeting to align expectations. Before starting the weekly sessions, the group should do a kick-off so that everyone can express their personal goals and agree on their expectations about what they want to learn, and how they want to learn it. Among the P2P groups at Booking.com so far, many have adjusted those guidelines to best fit their individual learning styles. One group, for example, decided to refresh their algorithms skills. As such, they didn’t do any studying at home, but instead picked a complex algorithmic problem every week for some hands-on programming. This enabled them to compare solutions and learn from one another. Another group wanted to study Deep Learning. They decided they wanted to have more structure, so they followed an online class together. Another group decided that the best way for them to learn was to build something, so they started working on a side project together. This meant that each of them could pick a part of the project that focused on the skills they most wanted to learn. It’s a good idea to schedule a kick-off meeting before you start the weekly sessions. This is an opportunity to find alignment among participants and clear up common logistical problems. A round table to give all participants a chance to express their personal expectations. A discussion on how you will make your learning relevant to the success of your organization. An agreement on what the group will learn, and how they want to learn it. If people have vacation plans that are incompatible with the level of involvement expected of the group, then it’s best they don’t participate at all. They will have a chance to join another P2P group on the same topic later. For some topics, having beginners and more experienced participants in the same group can cause difficulties. A possible solution is to split the group by skill level. If the group is too big, split it up. Six participants is generally the recommended maximum. Finally, if you get the feeling that alignment was not reached at the end of your kick-off meeting, don’t hesitate to do another one. How can we learn without teachers? Most of us suffer from what I call “Classroom Stockholm Syndrome”. We have been conditioned to think that the optimal way to learn is a course led by a teacher, and P2P groups challenge this belief. In the conventional classroom setup, students may refrain from asking questions due to the fear of sounding stupid. Most of the time is spent passively listening to the teacher, and communication often happens through the teacher, and not between students. 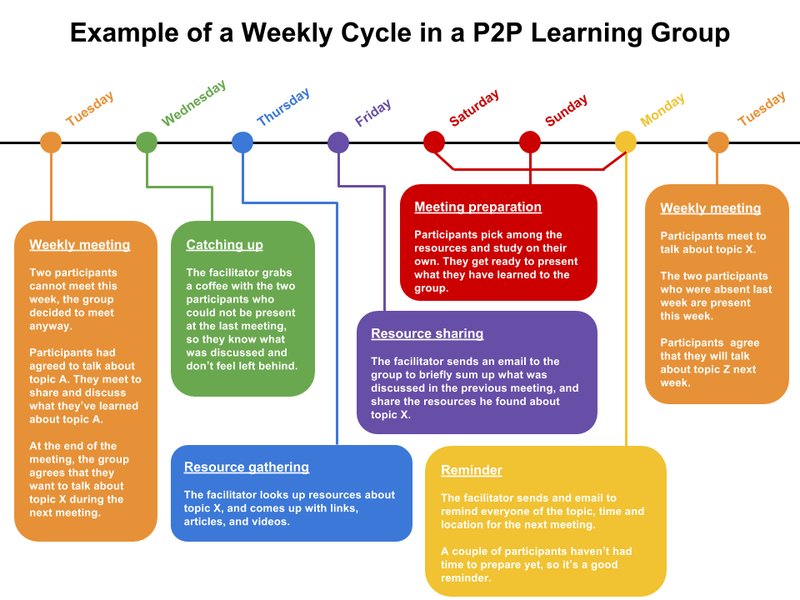 The regularity of weekly P2P sessions creates a positive peer pressure loop that encourages participants to study at home and avoid procrastination. By having to repackage content and explain it to others during weekly sessions, participants are actively involved with the knowledge and skills they are trying to acquire. P2P groups have worked well at Booking.com, but that doesn’t mean they’ll work everywhere. To start off, you’ll need to take small steps and treat P2P groups as an experiment. Your goal should be to do a single pilot P2P group in order to gather data and see if that format is a good fit for your organization. If you are happy with the results, then you can begin thinking about scaling it up. Before your start, talk to peers, your direct manager and your team to explain what P2P groups are about. Ask them what friction points they foresee and how they would solve them. Take plenty of notes when it comes to feedback and input – you never know when that extra info might prove useful. You’ll need to get buy-in from your manager to make sure they agree with you spending time on P2P learning. The number one rebuttal you might face is scope, so make it clear that you’re only experimenting with a single group at this stage. The decision to expand to more groups can be left for later, therefore in these early stages the cost is low. Another likely rebuttal is time investment. Why should your organization allow unsupervised training during working hours? First, if you pick a work-related topic, you will be able to invest what you learn back into your organization. Second, people who may not often interact with each other will create new bonds, making the organization stronger. Once you have the feeling that you have enough buy-in from your manager, you can move forward with your pilot group. Is there a topic you really want to learn that would benefit your organization, and for which there is no formal training? Great, make it the topic of your pilot P2P group! The mix of people you choose for your pilot group is critical. I recommend that you recruit people you consider to be “work friends”, as comfortable communication with them will be one less source of uncertainty. Go and chat with them individually to explain the concept of P2P groups and the topic you have in mind. Once you are done with your pitch, tell them on the spot that you want them to be a part of it. Remember to mention that they should inform their own managers too. Arrange your kick-off meeting as soon as you have a group of four to six people, including yourself. Once the group has its expectations aligned, you can start your six weeks of weekly sessions. Track your progress every week, taking notes of what goes well and what goes wrong; this will be invaluable when you reflect on your experiences. After reaching the end of your six-week pilot group, you should think about your learning on two levels. First, have you learned something about the topic you were interested in? Second, have you learned something about running P2P groups in the context of your organization? Spend some time asking participants for their feedback too. If you’ve learned that P2P groups are not the right thing for you, it’s no big deal. It’s already great that you had the energy and drive to get this far. If you’ve learned that it works and if the participants ask for more, you already have an opportunity to help more people to learn. At this stage, organize a meeting with the participants from your pilot group. As they have already been in a P2P group, they’re the perfect ambassadors to expand the initiative to more groups and topics. Ask them if there are other topics they would like to learn using the P2P format, and if they would like to be facilitators themselves. Depending on your organization, asking for help from whoever is in charge of regular training is almost certainly a good idea. They already have communication channels in place that you can use, both to increase awareness of P2P groups and recruit participants. Of course, autonomous peer learning isn’t perfect. Over the last 18 months, our Technology department has seen 50 P2P groups on technical and non-technical topics alike. Internal feedback surveys suggest that around 20% of those groups had an ‘unsuccessful’ outcome, meaning they either failed to reach the end of their six week timeframe, or stopped due to participant dissatisfaction. The most common reasons for the initiative stalling are a lack of structure, lack of time commitment, and incompatible expectations between participants. Although people can be motivated when they initially sign up, other work obligations may arise that prevent them from joining weekly sessions. It is common for a group of six to have only four or five participants at any given session. The best way for a group to deal with this is to meet anyway and help the absent participants catch up later. If this happens too frequently, however, it can completely derail a group. Finally, there is the challenge of finding high quality learning materials that are a good fit with the skill level of the participants. The P2P facilitator generally ends up doing this, so facilitating a group can be daunting and time consuming. If you want a group to succeed, you need a facilitator that is determined and proactive. Now go experiment with autonomous peer learning! There are many ways to approach autonomous peer learning! I hope that this article has given you a glimpse into how it has worked at Booking.com, and inspired you to look into autonomous learning in your own organization. Write a comment below if you have questions about P2P groups, or if you want to share your own experience with autonomous learning! Thanks to Jonathan Cooper for his help editing this article, and to Manuel Ceron, Stefanie Kolle, Vladimir Smirnov, and Oleg Komarov for their feedback on early drafts. Do you have experience in infrastructure, and are you interested in building and scaling large distributed systems? My employer, Booking.com, is recruiting Software Engineers and Site Reliability Engineers (SREs) in Amsterdam, Netherlands. If you think you have what it takes, send me your CV at emmanuel [at] codecapsule [dot] com.